The growing trend to save the planet from plastic and making people aware of its dangers leads an entrepreneur to pen a story of change. Amitabh nodded and said, “It’s a great idea, especially for India where we have an alarming plastic problem. I will publicise it.” Menon felt gratified. Over two years ago, in a blaze of publicity, Mollywood superstar Mammootty planted a seed. “Now it has become a 16-ft tree,” Menon says. She became eco-conscious first while working as a designer at an art gallery in San Fransisco a decade ago. “I was amazed at how people there take care of the environment. They will beautify even a small stream by growing flowers along the banks. I felt I had to do something, too, ” she says.Menon pushes hard for students to use eco-friendly pens. Thanks to her efforts, the Kerala government has adopted a Green Protocol for schools. As part of it, schools are banned from using disposable water bottles, styrofoam, plastic cups, plates, and food packaging, including aluminium and plastic bags. 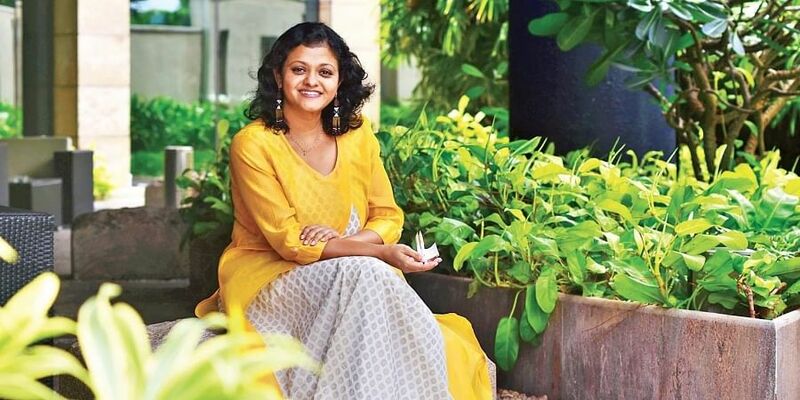 “Some schools are slow in adopting this protocol because of the lack of complete awareness among students and teachers about the damage plastic can do to the environment,” she says.Escalating her efforts to make Malayalis conscious of protecting the earth, Menon approached the organisers of the Kochi Muziris Biennale and, inquired about the possibility of creating a sculpture made of discarded plastic pens. Founders Bose Krishnamachari and Riyas Komu agreed. The response was unexpectedly stupendous. In the space of a single month, the office received seven-and-a-half lakh pens. In January, this year, 40 cyclists from Kozhikode brought along bags which contained one lakh pens. “The sculpture will be put up soon,” says Menon. Meanwhile, every now and then she gets a request that gladdens her heart. The pen is bonding families together. One such request was from a family in Coimbatore, which wanted to present her pens to their pregnant daughter-in-law’s family, who were coming to take her home. (As a ritual in Kerala, a family takes their daughter home in the seventh month of pregnancy where she delivers the child.) They bought 700 pens. Another family, which was preparing for a wedding, designed the wedding card in the shape of a tree. In it was a slot to put a green pen. The message read, ‘Let love grow like a seed’.Menon plants the seed of love in humanity and the environment as she pens the lines of change across Kerala. India is next. Ngangom Monalisa Chanu’s love for nature led her to make the ubiquitous pen serve dual purpose: writing and taking care of the environment. The 29-year-old Manipuri woman entrepreneur’s firm, Chanu Associates, has been producing biodegradable pens with seeds and pencils, under the brand name ‘Envi’, since March. While studying in Panjab University, Chanu’s idea had germinated. She crafted one, before setting up her venture in 2007. Vrundan Bawankar aspired to fly fighter planes, but she ended up piloting a project which not only aims to empower women but also expand the earth’s green cover. Women in her village located near Nagpur in Maharashtra make and supply paper pens, which carry tulsi seeds in their caps, and when disposed a plant is born. The women are now supplying the pens, priced at `5-7, across the country. award by the National Biodiversity Authority. But his return gift at the award function was what amazed everyone. He presented the dignitaries, including Governor ESL Narasimhan from whom he received the prize, with unique pens. 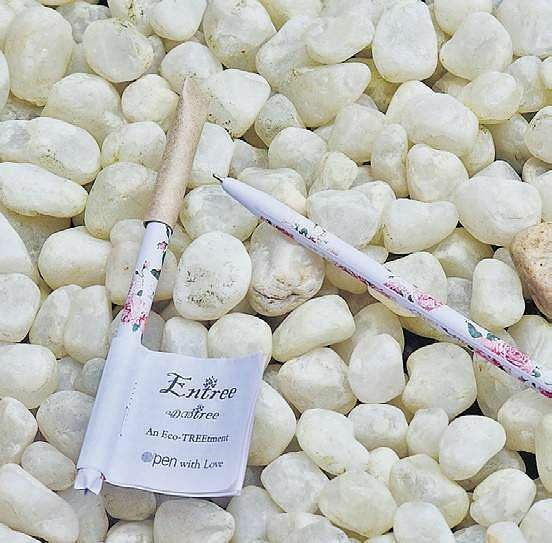 Made of paper, these disposable pens contain seeds which can grow into trees.